For the whole team at Inteliace, market research goes far beyond pure data gathering. Our goal is to collect, analyze and transform raw data into practical knowledge. We help our clients to take advantages of their understanding of consumers, competition and overall market structure. 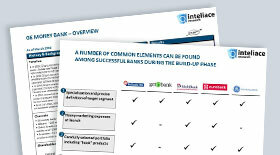 Inteliace Research has conducted several studies and research projects for top banks and other financial institutions operating in Europe including CEE. We research all available sources, including company/industry/country information, financial performance, analysis of competitors, KSF identification and more. We are adept at conducting face-to-face in-depth interviews, mystery shopping, telephone interviews, and other data-collection techniques. We can generate cost, staffing, and effectiveness analysis across various industries and functions. We assist those looking for business partners in the CEE area by providing contacts to alternative suppliers from "low-cost" countries, price quotes, and more. Inteliace Research offers management consulting services in the financial industry sector. We have a lot of experience in supporting management and supervisory bodies in preparing strategy documents, performance reviews, competitive analysis, and other analytical papers. We are primarily focused on financial services industry, including: banking, asset management and insurance. Are you interested? Please contact us by e-mail, phone or fax and we will be glad to help you!